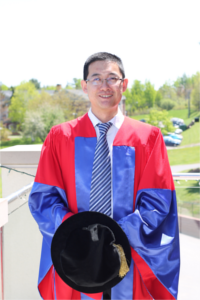 Recent UNB computer science graduate, Dizhi Zhou, has been named this year’s recipient of the Governor General’s Gold Medal at UNB. The Governor General’s Academic Medal is a prestigious award presented to the highest-ranking student at UNB. The gold medal is reserved for demonstrated academic excellence at the graduate level. Zhou received his Ph.D. degree in computer science in May 2014. Zhou’s research revolved around improving the multipath transport control protocol (MPTCP) for end-users with multipath transmissions. In essence, he devised enhancement solutions for multipath transmissions over wireless networks with cooperating mobile devices. His research has greatly contributed to multipath transmissions, cooperative wireless networks, and network solutions. During his doctorate studies, Zhou authored and co-authored an impressive 15 papers in various prestigious scientific journals and international conferences. Zhou’s research has been recognized internationally as well, with Zhou winning the Best Student Paper Award at the 10th Annual IEEE Consumer Communications and Networking Conference; and in 2013 he received a Chinese Government Award for Outstanding Self-Financed Students Abroad. Zhou graduated from UNB in May 2014, and now works as a software engineer at Alcatel-Lucent in Ottawa, Ontario.